My own cosplay was very femme, and I share Niki’s interpretation. Obviously, the TARDIS as female (and romantic companion of the Doctor) is now canon, with the wonderful Neil Gaiman episode “The Doctor’s Wife.” But this is an obvious example of one of my hypotheses in my project: namely, that cosplayers’ costumes and choices reflect their personal interpretations of Doctor Who. 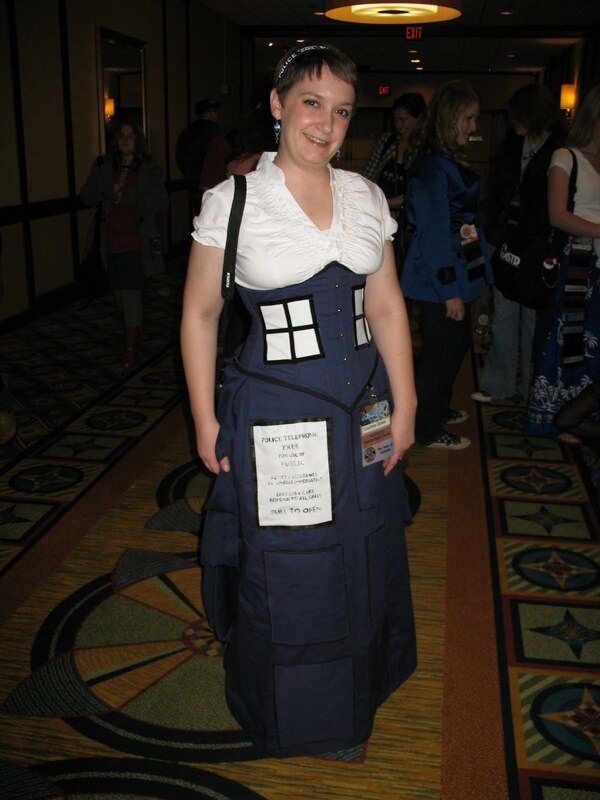 In this case, we can surmise that women dressing as femme TARDISes interpret the TARDIS as a femme woman. 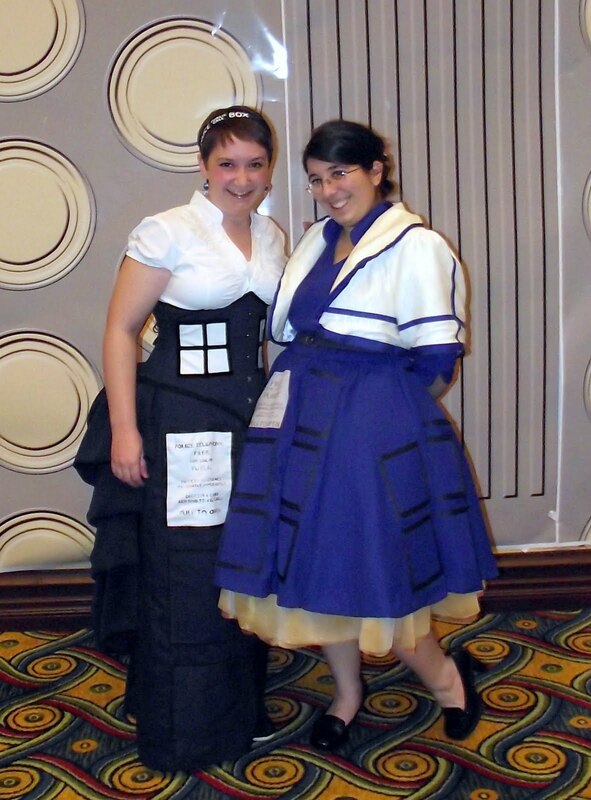 Me and Niki la Teer at Gally 2010. Niki is wearing a bright blue 50s-style flare dress, with repeating panels on all sides, topped by a navy-trimmed white cropped jacket. Not pictured is her cute hat, which is a pillbox designed to look like the light on the top of the TARDIS. Niki dressed as a 50s-style TARDIS because that’s the period from which the police box originated. As someone whose research interests mostly lie in the contemporary manifestations of the 19th century (mostly contemporary Jane Austens and neo-Victorianisms), steampunk is naturally fascinating to me. But I don’t think this fascination is the reason I chose steampunk, or a Victorian-esque design for my TARDIS cosplay. What is it about steampunk and Doctor Who that seemed to combine so deliciously? And why the TARDIS? Why didn’t I opt for a steampunk femme 10th Doctor (an option I considered briefly)? The answer seems to lie in the steampunk aesthetic itself. So what is steampunk? What defines its aesthetic? Annoyingly, steampunk defies definition. One part Victorianism, one part science fiction, one part magic, and found in literary and material manifestations, in costuming/fashion, in film and in graphic novels, steampunk seems easy to identify and hard to define; Ã¡ la Justice Potter Stewart, we know it when we see it. Or when we are faced with an overabundance of cogs. 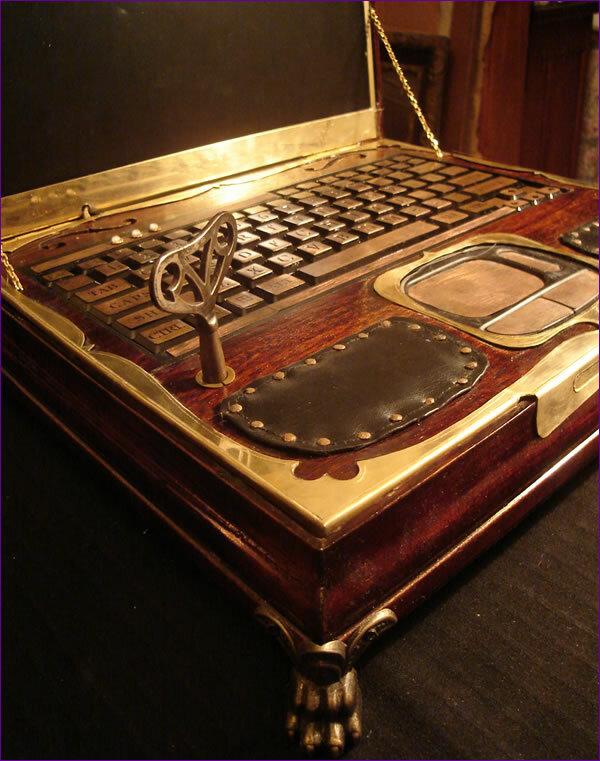 Brass and wood steampunk laptop with turn key and brass pedestal feet, modded by Datamancer. “asks us, perhaps via its material culture even more than through its fictional instantiations, to consider the apparent disjunction of a turn-key starter and a laptop computer. Then steampunk asks us to look harder and apprehend their aesthetic compatibility. Calling it aesthetic compatibility may, in fact, understate the point. In the laptop, modded by the technical artist Datamancer (Richard R. Nagy), the compatibility is operational: turning the key actually boots the machine. We might say steampunk takes the paradigm one step further and asks what happens when the markers of various time periods are estranged from their contexts and made simultaneous. […] The point of modding your laptop to look like a turn-of-the-previous-century machine is not to create an object so radically mashed-up that one cannot discern its functionality, but to discover their aesthetic commonalities, to blend them in a way that verges on cancelling [sic] the difference” (6-7). Basically, then, steampunk takes the past and combines it with the present, precisely to erase the differences between the two. “This approach to temporality,” Bowser and Croxall claim, “has the simultaneous and paradoxical effect of minimising the categorical differences between time periods. Steampunk illuminates the compatibility of laptops and brass, of steam engines and nanotechnology. Steampunk insists, in other words, on our continuing status as ‘other Victorians’ and does so in part through a manipulation of temporality that in its very machinations invokes the temporal revisions and reversals of the Victorian era” (10). Our belief that we are like the Victorians is what makes steampunk so very appealing; it projects a compatibility between us and the Victorians, between our culture and the (Western) culture(s) of the 19th century, between our technology and the inventions of the Victorian era. 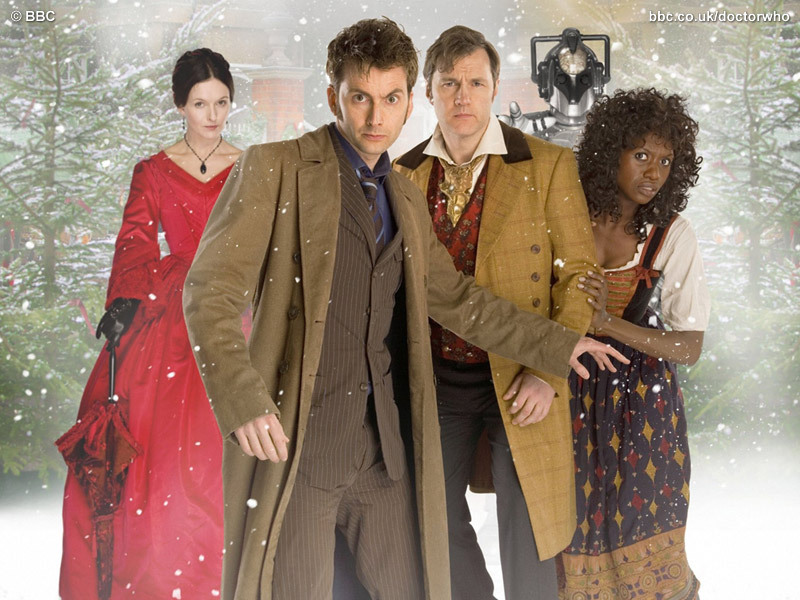 Promo shot for “The Next Doctor,” picturing Mrs. Hartigan in a red Victorian gown with parasol, the Doctor, the “next” Doctor (Jackson Lake) in a red patterned vest, gold cravat, and tan overcoat, and Rosita (his assistant) in a brown and gold patterned dress over white shirtsleeves. Doctor Who is a show that, similarly, revels in temporal anachronism. This is a show that likes to take us back to the past and remind us of our compatibility with that past. Russell T. Davies’s era, in particular, rather enjoyed jaunts to the past, and had a love affair with the Victorian era. Notable examples of traveling into the past in the RTD era are “The Unquiet Dead” (1869), “The Empty Child” (London, the Blitz), “The Girl in the Fireplace” (France, 1727), “Tooth and Claw” (Scottish moors, 1879), “The Shakespeare Code” (London, 1599), “The Daleks in Manhattan” (New York City, 1930), “Human Nature” (England, 1913), “The Fires of Pompeii” (Pompeii, 79), and “The Unicorn and the Wasp” (England, 1926). Going back in time is not intended to alienate the audience from the past. Rather, these episodes are characterized (like steampunk) by multiple anachronisms, multiple simultaneous meanings, and play. 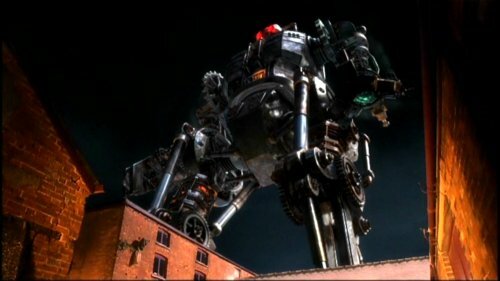 Giant steam-powered Cyberking, rampaging the city of London and coming into contact with the TARDIS hot air balloon. Further, the hero/ines of steampunk are usually tinkerers, inventors, and adventurers, all categories into which the Doctor undoubtedly fits. 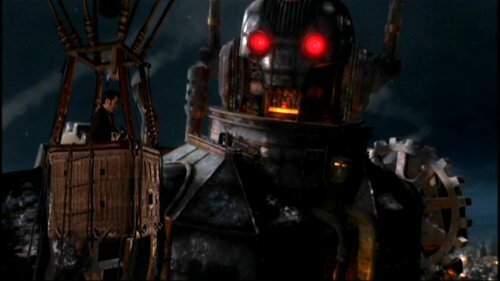 The compatibility of steampunk with Doctor Who is something that even the writers seemed to recognize in the production of “The Next Doctor,” set in London in the 19th century, in which the Doctor finds himself once again fighting the Cybermen, who construct a giant steam-powered Cyberking. In this episode, Doctor Who becomes translated in a steampunk version of itself, in which the Doctor carries an actual screwdriver, flies in a hot air balloon, and wears a spiffy vest and cravat. He fights the same enemies, but they are now steam-powered. Doctor Who works in the steampunk mode because that mode and its own normal operations are very similar; the tinkerer/inventor Doctor is not that different from most steampunk hero/ines and anachronism is definitional to both. But, as I pointed out, a steampunk TARDIS seemed so much better to me than a steampunk Doctor (although I’m still considering a steampunk femme 10th Doctor for another con). That may be because the most important thing in steampunk is not the bustles or the brown, but the tech. Steampunk has been described as a response to modern technology that has become sleek, small, and boring, exemplified by the iPhone or iPod. Contemporary technology is not only boring, it’s a black box. It’s outside gives no clue as to what it does or how it works, and it’s impenetrable. Not literally, obviously, but our own culture makes it difficult, if not impossible, for the layman to tinker with hir own tech. DRMs, EULAs, and warranties all reflect a certain attitude about how appropriate it is to bust open your technology and mess around with it, and the non-mechanical nature of tech like iPods, computers, and cell phones make it difficult for most people to learn how to tinker with it anyway. This isn’t just frustrating, it alienates people from the tech that literally shapes many people’s lives. As I mentioned before, steampunk hero/ines are usually tinkerers; Bowser and Croxall argue that the high-adventuring hero/ines of steampunk “not only […] build their own devices, but also […] discover and develop the science behind them” (20). Steampunk “stages a rejection of received notions about how technology should be treated and who should discover, make, or modify it” (21). 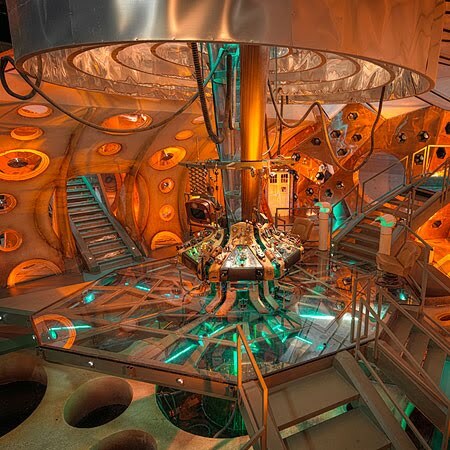 The inside of the TARDIS from the Russell T. Davies era of the show. Steampunk, then, remakes and reimagines technology. The cogs everywhere in steampunk art and attire are not merely decorative (even when they are decorative), but signal to the importance that mechanical and visible tech in the steampunk aesthetic. Steampunk tech is big, bulky, and its works are highly visible, with cogs, gears, and inner workings proudly on display. This tech is no black box. Scott Westerfield, author of Leviathan, claims that “the Internet is global and seemingly omniscient, while iPods and phones are all microscopic workings encased in plastic blobjects. […] Compare that to a steam engine, where you can watch the pistons move and feel the heat of its boilers. I think we miss that visceral appeal of the machine” (qtd. in Grossman). Tech in steampunk becomes not just visible and workable, but difficult. Sean Orlando of Kinetic Steam Works claims that steampunk is for “people who want to struggle, lift and heave their technology” (Farivar). Apple gives us toys that are silver, slick, easy to use, and difficult to tinker with. Steampunk gives us something different: tech that is bronze, dirty, difficult, dangerous, and endlessly tinkerable. 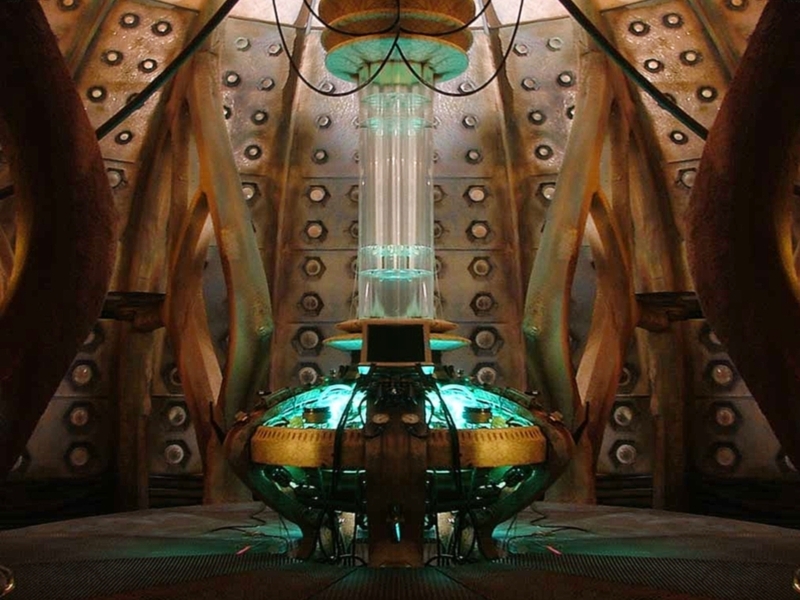 The inside of the TARDIS for the current Doctor Who era. If that’s the case, then my choice of the TARDIS is no surprise, particularly when I think about how important I thought it was to sew some gold and silver clock parts onto the skirt and the white shirt. (I finished the costume right before the con, literally in the hotel, so I haven’t finished this detail yet.) The TARDIS is not a perfect example of the steampunk aesthetic, since its many visible parts are a bit inscrutable to human companions, but it is steampunk to the Doctor. It’s a very manual machine, requiring a lot of running around the console and pushing buttons, flipping large switches, and occasionally giving it a good thump, and it’s parts are all highly visible, with so many knobs, buttons, and curiosities about. (This is true about both the TARDISes from the new series, though the 9th and 10th Doctors’ TARDISes have more of a steampunk aesthetic in color scheme, since the machine has more faded, rather than shiny, colors, and is more navy, rather than bright, on the outside and bronze on the inside..) Further, we can see it work in the same way we can see the steam engine’s pistons work. When the Doctor finally flips the switch, the movement in the center of the console and the loud noise the machine makes are both radical departures from the way our modern technology works. The TARDIS is certainly visceral, dangerous, and tangible in a way that a smartphone simply can’t be. This is not all to argue that Doctor Who is steampunk. In fact, I don’t think that is true. Rather, I think Doctor Who is compatible with steampunk, and shares some of its aesthetic concerns. The Doctor is easily reimagined as a steampunk hero, and the TARDIS as steampunk technology. They both use the past to understand the present and future, and tend to collapse the categorical differences between time periods. The best part is not that they are compatible, though, but that my interpretation of them as compatible is visible in my cosplay and my thought process as I constructed it. Every choice I made reflected the ways in which I thought steampunk and Doctor Who meshed and the ways in which I thought they didn’t. (For example, I didn’t wear spats or heels, but black TOMS shoes, since the 10th Doctor wears Converse shoes, and that, at least for footwear, function and comfort are more important in Doctor Who than prettiness.) Cosplay has the potential to show us much more than what characters a cosplayer likes, identifies with, or appreciates the costumes of. It can tell us more than “I love Doctor Who.” If we look hard enough, we can read whole arguments and interpretations in cosplay. Fashion, after all, speaks volumes. Bowser, Rachel A., and Brian Croxall. “Introduction: Industrial Evolution.” Neo-Victorian Studies 3.1 (2010): 1-45. Neo-Victorian Studies. Web. 17 June 2011. Farivar, Cyrus. “Steampunk Brings Victorian Flair to the 21st Century.” NPR. All Things Considered. National Public Radio, 6 February 2008. Web. Accessed 17 June 2011. Grossman, Lev. “Steampunk: Reclaiming Tech for the Masses.” Time Magazine. Time Inc., 14 December 2009. Web. Accessed 17 June 2011.
la Teer, Niki. Personal interview. 19 February 2011. Thank you for this post. I have been “into” steampunk for a while, but as a feminist and a computer geek by trade, it’s been very difficult to understand why I find it so appealing. The quote from Bowser and Croxall makes a lot of sense to me though. I love the fashon, I love making costumes inspired by it, I like the romanticized idea of Victorian science, and I want to take those good things and apply them to now. I want my computer to be fast and beautiful. I want to be liberated and wear a corset. I feel like there’s a sense of reverse science fiction, and by playing with the past, it can help us understand where we’re going. Note from elsewhere: tigtog writes This post combines so many of my favourite things I had to read it in stages so that the squee would not overwhelm me. This post is so much win. Not just the convergence of topics, but the writing too. Just a wee comment on why I think the whole “Dr Who” fandom as such is so compatible with, and understanding of the steampunk ethos. I’m coming in as an “Old School” Dr Who fan – I grew up watching the Doctor on repeats on the ABC every week-night, “my doctor” is a combination of Jon Pertwee and Tom Baker – and I think at least part of the beauty of the whole mythos is that there are visible moments of steampunkery, long before the concept of “steampunk” was actually isolated. For example, for a brief period in the Tom Baker era, there was the use of the TARDIS’s secondary console room – a very Victorian, wood-panelled space. There were also the “stranded” years of the early Jon Pertwee period, where the Doctor literally couldn’t travel anywhere, not only because the TARDIS was malfunctioning (as she tended to do with distressing regularity) but also because the necessary knowledge had been blocked from his conscious mind. End result was that the Doctor’s relationship with the TARDIS became very much like that of an automotive geek with the classic Daimler they were rebuilding in the garage – there were always bits of machinery and obscure bits and pieces here and there on the workshop bench, and occasionally he’d do the equivalent of revving the engine (although he couldn’t leave). But the machine itself didn’t function properly. The compatibility between the Doctor and the steampunk community has been there from the start – and the Doctor’s rather visceral relationship with the technology he was dealing with helped a lot, I think. (I’ve always had the impression that the Doctor only just refrained from swearing at the TARDIS on occasion, and gods know he would have had a wide range of languages to choose from).